Neither of these books have anything to do with forgiveness, but will help you to grow in your faith. This in turn will give you a better understanding of Christ's call to love one another. Matthew Kelly has written a book called The Fours Signs of a Dynamic Catholic. It is a good read. You can purchase it at the link above. 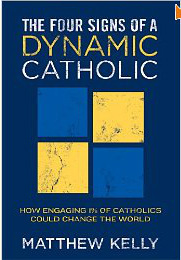 Kelly is a well known Catholic writer who also wrote the book Rediscover Catholicism. Another book that is worth the read is Chris Padgett's Spirituallity You Can Live With:Stronger Faith in 30 Days. You can buy the book at the link above. Chris is a Catholic convert. He travels around the country as a speaker and evangelist. He writes with a unique voice that is fun and easy to follow. So that you are just in your word, and without reproach in your judgment. clean heart create for me, God; renew within me a steadfast spirit. Forgiveness is an important thing. Read what the Mayo Clinic has to say about the importance of it and then share this site with your friends. Want to hang out and learn about your faith while drinking a beer? Right too good to be true. Nope you can do just that with the new Brewing Faith Series put on by the diocese. Go and take your friends. Listen to podcasts? Well here is one about What Forgiveness is Not. It is about a year old, but it is a good listen. Here is what I challenge you to do. Find a good Catholic podcast and listen to it once a week. Another good one is SQPN- Fr. Rodrick. He is a media maniac.